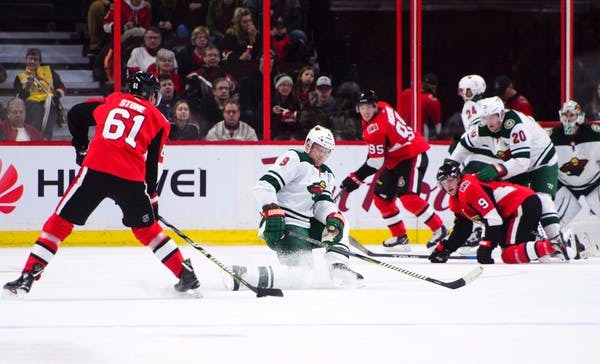 It’s only a two-game skid, but this is the longest the Wild has gone without a point this season – a short slump the team has a chance to end Wednesday when it hosts the Senators at Xcel Energy Center. Before falling to the Blackhawks 3-1 Sunday in Chicago, the Wild was upended 3-2 by the Sabres at home Saturday after giving up three unanswered goals. What underscored both losses was the team’s inability to cash in on a plethora of shots, as the Wild scored just three goals last weekend on 79 shots. Foligno didn’t finish that game against the Blackhawks, exiting in the third period after he got hit with a shot on the outside of the right leg. Despite getting helped off the ice and hobbling after the game, Foligno was back at practice Tuesday and is fine to play against the Senators. 6-2-2: The Wild’s record at home this season. 5: Power-play goals in the last four games. 18: Goals by the Wild’s blue line – same for Ottawa’s defense. 6: Points for winger Mikael Granlund in the last seven games. 8-4: Goalie Devan Dubnyk’s record in the past 12 games. This is the start of a four-game road trip for the Senators, who have won two of their previous three games. Overall, they’re 9-9-3 and 2-5-1 on the road. Ottawa has been particularly successful on the power play, going 18-for-72. Center Matt Duchene has a team-high 27 points. His 10 goals also pace Ottawa.